Kit for the hobbyist or semi-professional user alike. 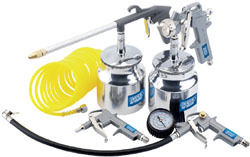 Designed for use with receiver compressors, the kit gives various options of spraying, inflating and cleaning, all in one multi-purpose kit. Fittings all 1/4" BSP male thread.